You have to acknowledge that lots of creativity comes from the surf community. With clothes, shoes, equipment and special events, it's as if anyone who ever rode a wave strives to preserve his or her lifestyle by turning the hobby into a business. Doug Smith is just such an action sports entrepreneur. 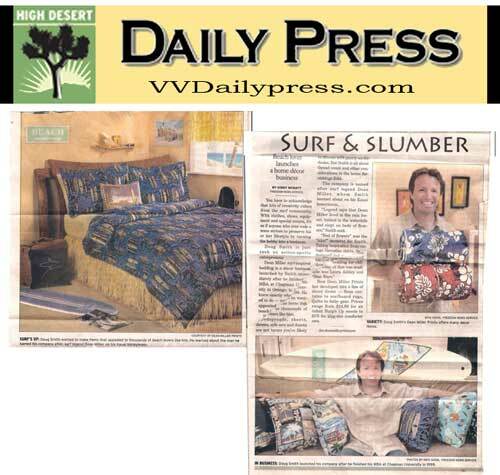 Dean Miller surf-inspired bedding is a decor business launched by Smith immediately after he finished his MBA at Chapman University in Orange, in 1999. He knew exactly what he wanted to do - to make items that appealed to thousands of beach lovers like him. Bedspreads, sheets, throws, crib sets, and duvets are not terms you're likely to discuss with gnarly surfer dudes. But Smith is all about thread count and other considerations in the home furnishings field. The company is named after surf legend Dean Miller, whom Smith learned about on his Kauai honeymoon. "Legend says that Dean Miller lived in the rain forest, bathed in the waterfalls and slept on beds of flowers," Smith said. "Bed of flowers" was the "Aha!" moment for Smith. Taking inspiration from vintage Hawaiian shirts, Smith designed his line of bedding for children when all that was available was Laura Ashley and "Star Wars." Now Dean Miller Prints has developed into a line of decor items - from curtains to surfboard rugs, quilts to baby gear. Prices range from $24.99 for an infant Burp's Up onesie to $175.00 for king size comforter sheets.